First, please let me say that nothing is for sale. Yet. 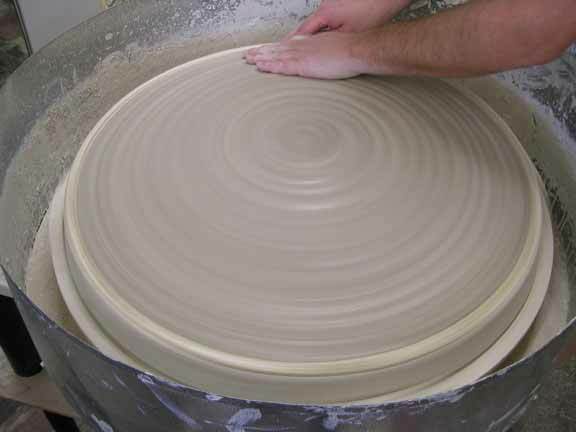 Still making a few of the big plates. I have a new vision for them. 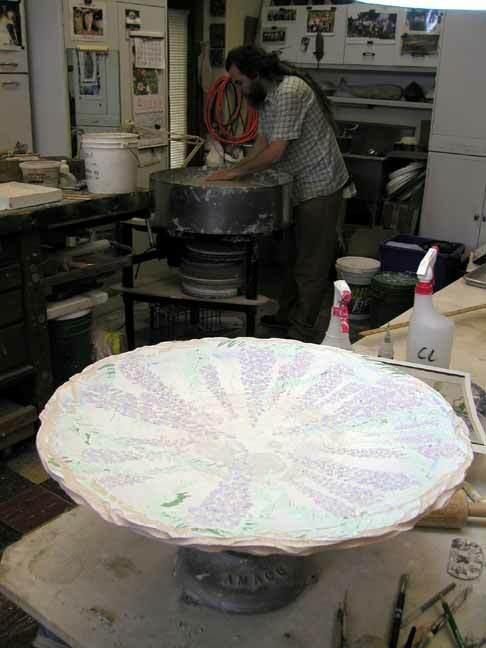 Here is my buddy, Aaron, turning one of the plates while I glaze one. The frog farm! These are going to get some unusual glazing. 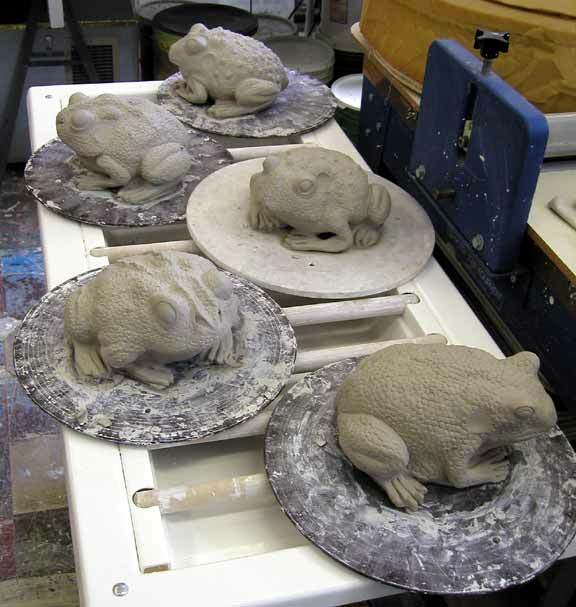 The next few of the frogs will be imbued with personality ala Martin Brothers. 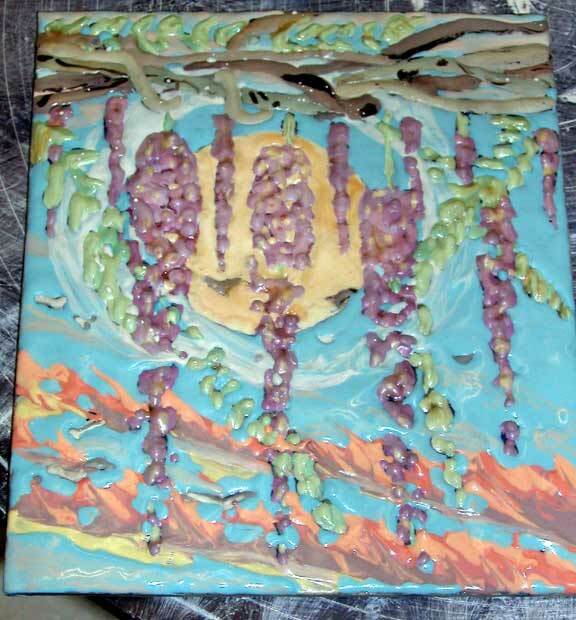 Here is the back of one of my tiles. I can't seem to let a blank piece of clay alone. I have to do something with it. Why not? Right? 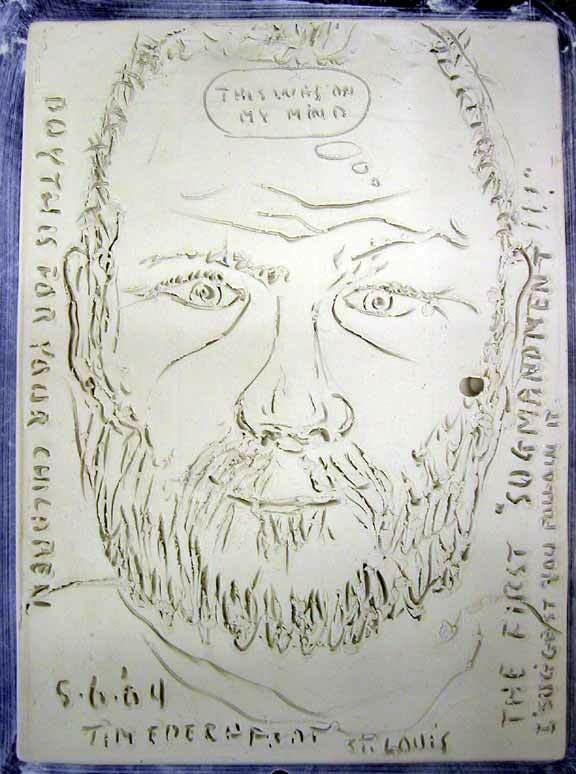 Buy it and you get a tile AND a drawing. Of course it will cost you more. Some very small pots. Anyone out there want a floor vase for a doll house? I have been reglazing some tiles that were previously stinkers. 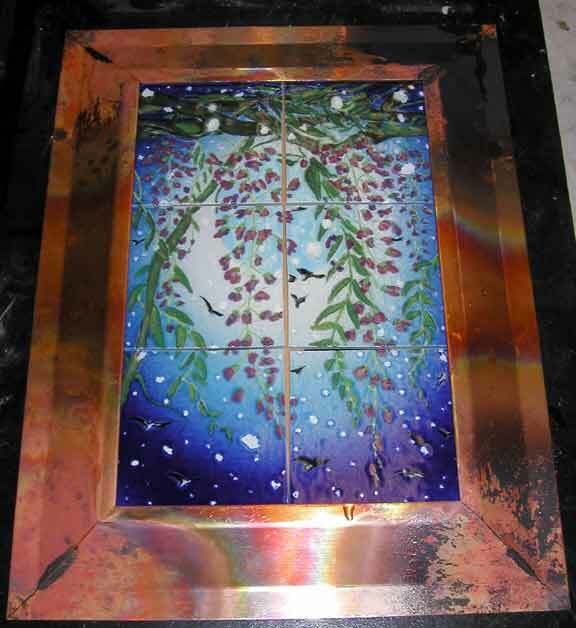 Here is one ready for the kiln. The result of the firing is down this page. A big grape vine pot all glazed up. 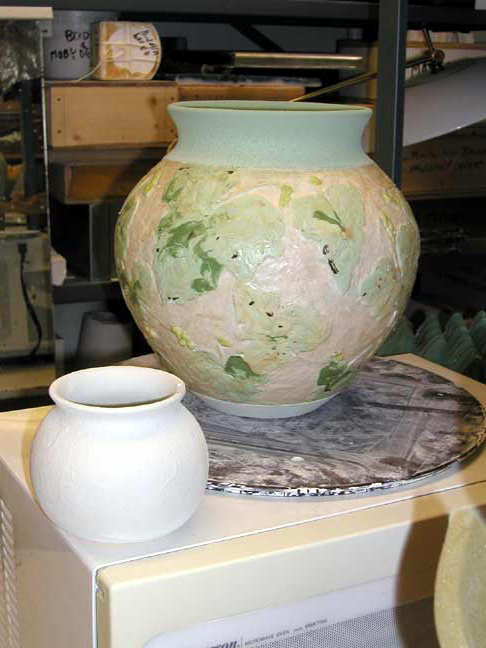 It came out of the firing a loser, but it has already been reglazed and is waiting to be fired again. 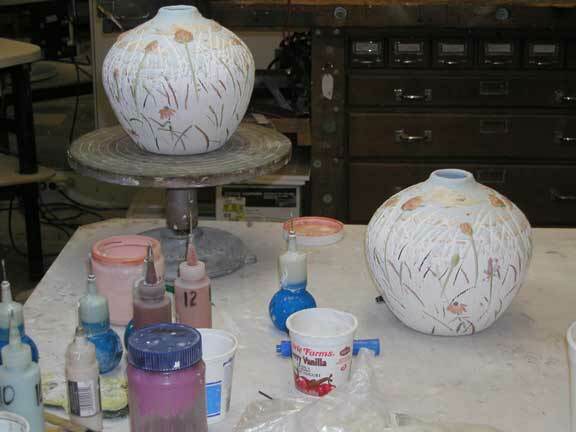 And a pair of Chive pots in the process of being glazed. 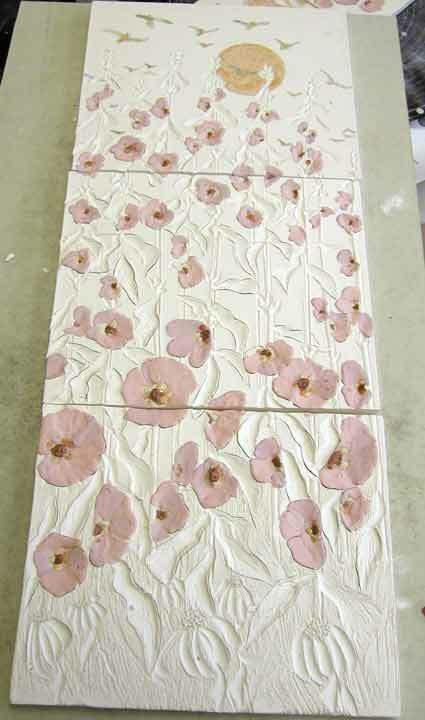 The last weeks were spent working on tile panels. This particular single tile was one of a six tile panel. One of the tiles cracked in the bisque and this single tile was the only one worthy of more attention. OK, I am breaking my silence and showing you my "secret" project. MY ADVERTISING CLOCK!! Cool?? It has been a long difficult process. It has been a four month project to get to this point. But obviously worth it. At least to me. Up in Zaneville, I'll see if it worth it to you! Want to collect 12 of my best designs at one time? Start saving. And be at the door early. I will only have a few by July. (I have been loosing half of them to various problems to date. I have to turn that around.) I have special clock hands for it as well. 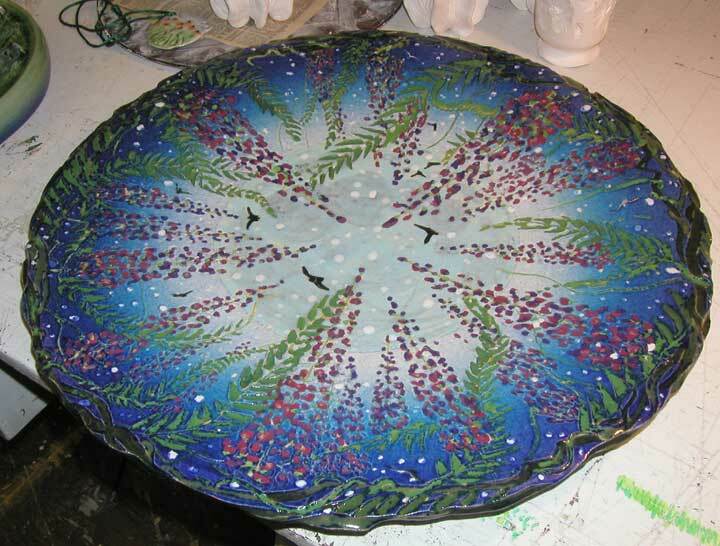 Glazed up another of the wisteria plates from last year. It is going to get another effort. Nice, but could be better. 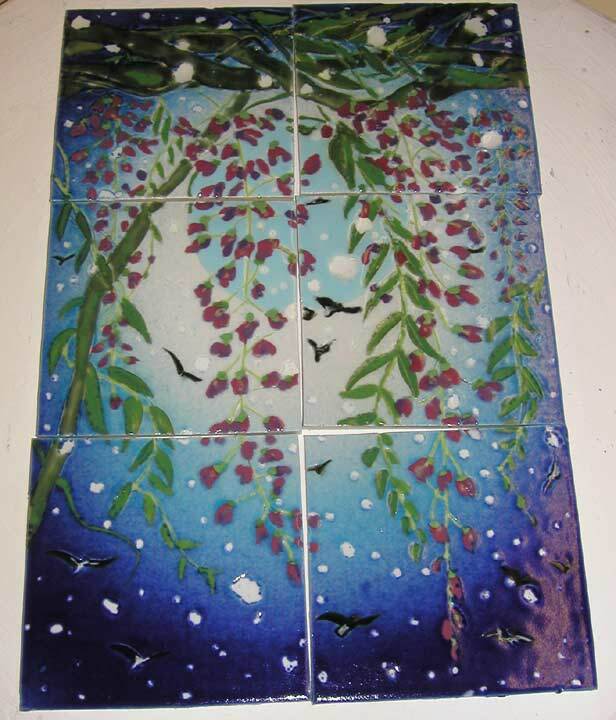 How about a lyrical wisteria and blue moon tile panel. Wait- it gets better a bit down the page. I just know that this panel is going to be the star of the show. Hollyhocks on a hot summer day. 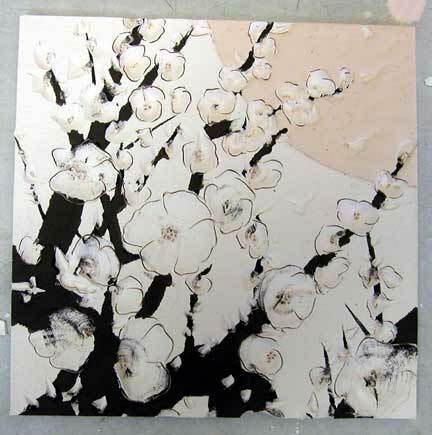 The background glaze is going to be simmering heat. Pushing tiles where no tiles have gone before. 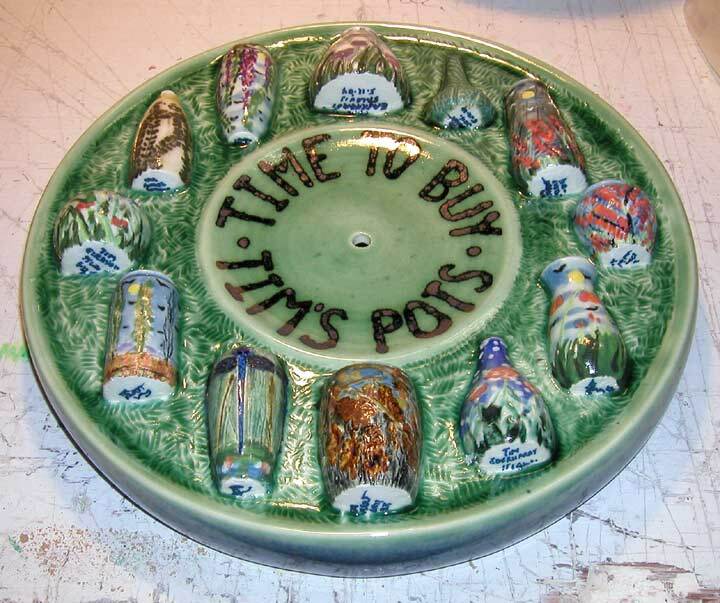 I want all you pot collecters to start thinking differently. The wall. Think: the wall. Out of surface space? The wall. 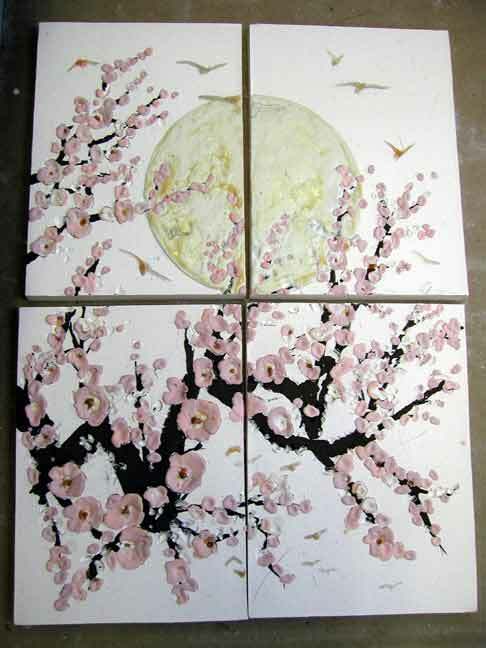 This will be a killer cherry blossom panel. 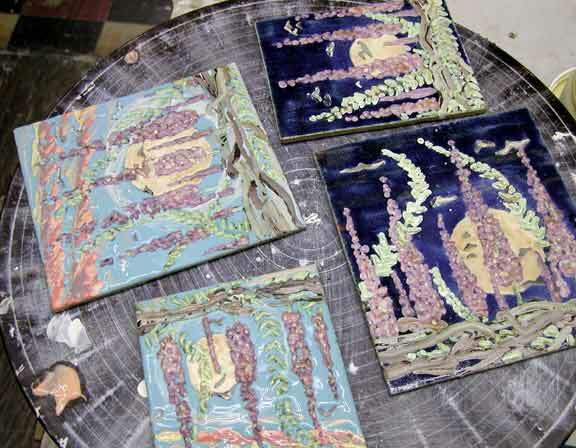 Here are two of the reglazed wisteria tiles mention above. Wait till you see the poplar tree panels!!! !